There was a spot of baking here this morning. We were taking a little something to a party for a special 7 year-old. 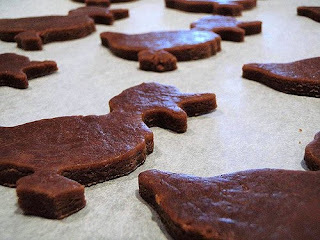 So what to bake for a boy who likes birds? I had grand plans for the plumage, but forgot an important decorating principle: less is more. I was a little heavy-handed with the icing and sprinkles. And once I got the whole flock together, they morphed into something that would send shivers down Tippi Hedren's spine. Yes, Tweenage Mutant Ginger Turtledoves. Of course appearances aren't everything. The kids seemed to like them! Place the butter, sugar and honey in a saucepan over low heat. Stir until the ingredients are melted and the sugar dissolved. Boil for one minute, then remove from the heat. Leave for 5 minutes on the tray before removing to cool completely. Decorate. You do General Silliness like no other. Don't DARE stop! We love General Silly. 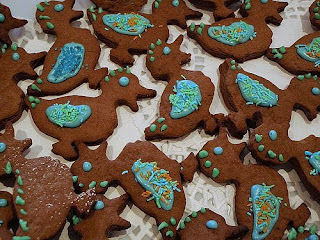 Well, everyone knows the only way to defeat those pesky Tweenage Mutant Ginger Turtledoves is to eat them all up! they look wonderful Liesl! I love how you decorated them. I love them - and I bet they took an age to make. Very cool baking Mrs Bumpo! 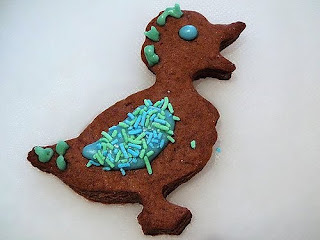 Your little ducky cookies are so cute! 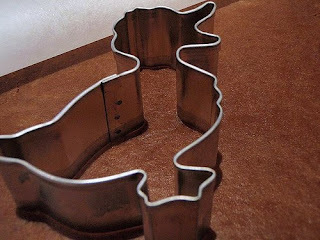 I love a good gingerbread recipe.